This is a topic that I have presented and taught multiple times, and it is something I am quite passionate about. I think it is also increasingly relevant as SQL Server 2014 will be falling out of Mainstream support on July 9, 2019, and both SQL Server 2008 and SQL Server 2008 R2 will be falling out of Extended Support on July 9, 2019. Next July is sort of a looming deadline for many organizations! 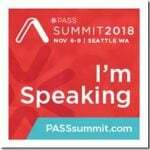 I am also going to be doing a preview version of this session in the first slot of the next 24 Hours of PASS Summit Preview event on June 12th, 2018. Hopefully I will see you at both events!